These images are from our new Hoof Distortion book. Many hoof cracks are slow to resolve, but quick to reappear. 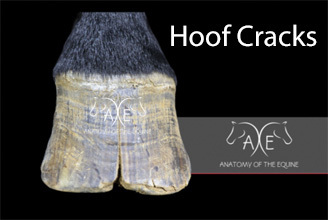 A look inside the hoof gives clues on why you may be struggling to keep cracks at bay. Luckily horses are rarely lame from surface cracks, but when you see the extent of the internal damage beneath these seemingly minor cracks, it is mind-blowing that this is the case. After carefully dissecting the wall behind toe cracks, the soft tissues and coffin bone frequently show damage. Is this damage permanent? It is hard to tell. It would be logical to think that the boney changes would be irreparable, but we cannot state with certainty that the soft tissues are permanently affected. That is the down fall of dissections - they are always looking at a single fixed point in time. The sensitive and insensitive laminae are clearly damaged behind this crack. The insensitive laminae appear to have fused and thickened. Could it be pressure from this change has caused the bone to erode? The pictures below make you wonder if this is the case. 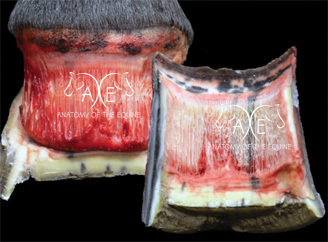 You can clearly see the changes to the inner hoof and insensitive laminae. Hoof care providers should be relieved to know that this truly is a real problem. 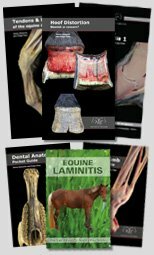 Our dissection books give you the tools to be able to show your clients exactly what may be going on behind the crack and how that means they are always going to need constant management. There are more images of hoof cracks in our new book. 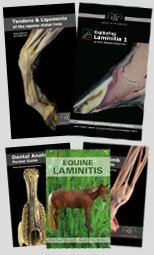 We have included dissections of a single toe crack; two hooves that have double toe cracks; and a really bad quarter crack. Jenny and I are excited to create webinars that share even more images. Our books only include a tiny number of images that we have taken. Webinars will be a great way to interact and answer your specific questions. If you are interested in upcoming webinars, please sign up below so that we can keep you posted.